A sentence consists of a subject and a predicate, and every predicate contains a verb. The verb tells what the subject is or does. Sometimes, the verb is more than one word in the sentence. There are three main types of verbs: action verbs, helping verbs, and linking verbs. A sentence consists of a subject and a verb. The verb tells what the subject is or does. The first of the three types of verbs, the action verb, describes what the subject does, did, or will do. Served is an action verb in the sentence below. It tells what Connecticut did. Connecticut served America's first hamburger. Sometimes, a sentence has more than one action verb. In the sentence below, ticks and chimes are two action verbs telling what the old clock does. The old clock ticks loudly and chimes every hour. Use descriptive and precise action verbs to make your writing more vivid or colorful. The second of the three types of verbs is the helping verb. The main verb in a sentence may have one or more helping verbs. The main verb shows the action; the helping verbs do not show action, but they help to form the verb tense. You might have wondered about the origin of teddy bears. In the sentence above, "wondered" is the main verb, and "might" and "have" are helping verbs. "Might have wondered" is the entire verb phrase. The third of the three types of verbs is the linking verb. A linking verb "links" the subject of a sentence to the rest of the predicate. It does not show action, and it is not "helping" an action verb. Its purpose is to connect a name or description to the subject. In the sentence above, was links "Woody" with "folksinger." The word folksinger names Woody's occupation. In the sentence above, was links "Woody" with "successful." The word successful describes Woody. We identify types of verbs by recognizing how they are used in a sentence. Some verbs can be used as either linking or action verbs. To tell whether a verb is a linking verb, we replace it with a form of the verb "to be"—is, am, are, was, were, be, being, been, as in the example below. Because the sentence still makes sense, we know that feels is a linking verb in this sentence. Now, let us examine the word feels in the sentence below. Yin feels the warmth of the sun. Yin is the warmth of the sun. The sentence no longer makes sense, so we know that feels is not a linking verb in this sentence. Tense means time. All types of verbs tell us not only what action is occurring but also when it is occurring. The form of a verb, or the verb tense, changes in order to show when the action takes place. There are three simple tenses and three perfect tenses. The present tense refers to action that is happening now. We add an s when the subject is singular, except when the pronoun is I or you. The past tense shows action that has already occurred. The future tense refers to action that has not yet occurred. The future tense is usually formed with the helping verbs shall or will. With the pronouns I and we, the use of shall is preferable in formal writing. Every verb has four basic forms, or principal parts: the present tense, the present participle, the past, and the past participle. They are necessary to form all the tenses of each verb. The third principal part of a verb, used to express past time, is the past tense, which we form by adding ed to most verbs. The fourth principal part of a verb, used to form the perfect tenses, is the past participle. It is preceded by a form of the have helping verb. With regular verbs, the past and the past participle are the same. There are three perfect tenses—present perfect, past perfect, and future perfect. The perfect tenses show that an action has been completed or "perfected." To form these tenses, we add a form of the helping verb have to the past participle. The present perfect tense describes an action that occurred in the past and is complete or continuing in the present. 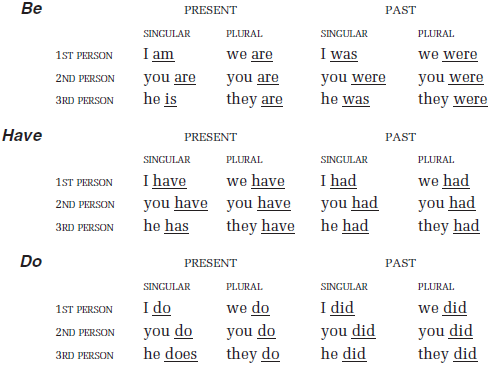 We add the present forms of the verb have to the past participle. Jamie has walked to the store many times. The past perfect tense describes past action completed before another past action. We use the helping verb had before the past participle. Jamie had walked to the store before she went to school. The future perfect tense describes future action to be completed before another future action. We add the future form of the helping verb have to the past participle. Jamie will have walked to the store and back twice by noon. Regular verbs form the past tense by adding d or ed to the present tense of the verb. Irregular verbs form the past tense in different ways. Three of the most frequently used verbs in the English language are be, have, and do. The tenses of these verbs are irregular; they do not fit the pattern of the regular verbs. Therefore, we must memorize them. Below are charts showing the verb forms of be, have, and do. There are no rules for forming the past tense and past participles of irregular verbs. Fortunately, we recognize the principal parts of most irregular verbs just by hearing them. We must memorize the irregular verb parts that we do not know already. Irregular verbs cause people trouble because it is easy to confuse the past and past participle. She has gone (NOT went) to work. The concert began (NOT begun) on time. There are many more irregular verbs that may follow the patterns above or may not. Always consult the dictionary if you are unsure.